I am a successful business owner and entrepreneur and I am taking this opportunity to take you inside this exciting industry. I have been performing and gathering secrets for over 20 years in this highly untapped performance art market. Sometimes I’ve been doing it part time and others times I was cranking out a ton of shows… But that’s part of the beauty of learning this skill. You can do it when you want to! I am going to share all of my secrets with you so you can easily learn and duplicate my success! I haven’t been clocking in, I’ve been playing around and making thousands of dollars twisting balloons. I not only twist balloons for cash on a regular basis, but I have worked behind the scenes with top industry performers in major corporations! I am going to show you how to twist balloons like a pro and find the highest paying most lucrative gigs! Everyone knows that experience and knowledge bring power and money! Well, get ready, you are going to jump right to making money. You don’t have to begin with trial and error. I will show you the tried and true ways to make profit right away! 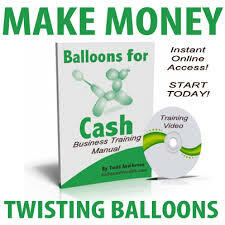 All you have to do is twist balloons and fill your pockets with easy cash!